Pitching is something that needs lots of practice to hone your skills. 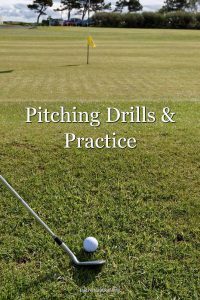 Practicing these golf pitching drills with help you start saving shots around the green. The goal of golf is to hit the fairway with your first shot, and the green with your second. Unfortunately, that objective is not always fulfilled to satisfaction. When your efforts from the fairway fall short, you are going to need to utilize one of the handiest techniques in the game of golf: the pitch shot. The pitch shot is one of the simplest maneuvers to perform, and one of the most difficult to master. Today we will be going over how you can get your pitch shot in tip top shape so that you can enjoy lower scores during your next loop. We’ll also look at some pitching drills you can use to practice. Before we get into the mechanics of the shot, it is, of course, important to also mention when it will serve you best. The pitch shot is a relatively small motion that doesn’t create very much clubhead speed. For that reason, it is a great technique to apply to shots that are within forty or so yards of the hole. As I said, when it comes to the pitch shot, you are dealing with a pretty simple motion. With a slightly open stance you will simply bring your club back with a gentle hinge of your wrist, stopping when the head of the club reaches the height of your hips (or sooner, depending on the length of your shot) then you will bring the club back down on the ball, and then through to a finish that matches the length of your backswing. If you are new to this technique you might at first find it a little bit difficult to control the length of your shots. The pitching technique is what you might hear people refer to as a “feel shot,” meaning that since each circumstance that you use it in will be somewhat unique, you may have to rely on intuition as well skill. In order to enjoy a wider range of distances without facing the need to alter the length of their backswing, some players will experiment with a wide variety of clubs, ranging from their sixty-degree wedge, all the way down to their pitching wedge. Utilizing different clubs for the pitch shot allows players to keep things consistent and simple. Other players, however, prefer to use only one club for all of their pitch shots, and alter the length of their backswing as needed. Which method you decide upon will depend entirely on your preference. Once you get the motion I described in the last section down, you will want to put it into use on the practice green. Ideally, your practice facility will have an area in which you can hit shots from about forty yards out and in onto a green that resembles those found on the course. As you practice, your goal should be to hit a range of shots from a variety of distances. Try to experiment by hitting shots with a lower trajectory, a higher trajectory, a neutral trajectory, etc. Since no two shots will be the same on the course, you will want to make sure that you are prepared for whatever situation you find yourself in. If you want to hit a higher shot without changing your club selection, or even the way in which you swing, simply move the ball up forward in your stance. Similarly, if you want to hit a pitch shot with a lower trajectory, move the ball back in your stance. The objective is going to be to perfect your distance control. Pay close attention to how far the ball travels when you bring the club back to your knees, your hips, etc. Try not to hit too many balls from the same spot. The more you move around, the more you will be prepared for the unpredictability of course. Now, as promised, let’s take a look at some pitching drills you can use to improve your skills. Just hitting shots over and over again is certainly better than nothing, but you may find that utilizing some drills will make your practice sessions more productive and useful. Here are a few drills that should see you hitting better pitch shots. I wouldn’t recommend spending a lot of time with this drill, but I do think that it is a good way to warm up on the practice green. To perform the underhand drill, you will not need a club. Simply face your target, and toss balls underhanded at it using your dominant hand. Why does this help? The underhand motion is going to be similar to that of the pitch. This is a great way to get a feel for how much you need to bring the club back and through in order to see your shot land near its target. The clock drill is simply a way in which you can gauge how far to bring your club back and through. In order to perform it, think of the axis of your swing as the face of the clock, with the ball positioned at the six o’clock marker. Then, simply hit your shots the way that you always do, and make note of how far your shot goes when you swing from four-eight o’clock, five-nine o’clock, etc. Why does this help? The clock drill will give you a firm understanding of the distances you can expect your shots to go. It will also simplify the mental process when you step up to a shot on the course. Rather than thinking excessively about your backswing, you can simply make the decision to swing from five-eight o’clock, and be confident that you know where your ball will wind up when you do. The final drill that we will be looking at today is pretty much exactly what it sounds like. In order to hit a good pitch shot, you are going to need to rotate your upper body and your arms together. Placing a towel under your arms pinned against your body as you hit shots will help ensure that your form is in good shape. If the towel remains pressed to your chest beneath your arms, you can be confident of the fact that you are rotating your upper body well. As you can see, this simple motion requires lots of practice. While heading over to the pitching range is rarely as exciting as working on your drives, there’s no excuse now you know how to practice pitching. One thing’s for sure – you’ll be very glad that you took the time to practice these pitching drills when you start saving shots around the green.